Seeing is Believing This sample manual to teach Developing Your Executive Presence is in MS Word format. Look around the classroom at your students. They deserve your best. You deserve the best, and as a trainer you've come to the right place. This course on Developing Your Executive Presence will have you shaping mere mortals into industry-leading paragons of excellence and virtue in no time at all. This one-day course allows your students to advance from their current status to the lofty levels of the corporate realm in no time at all. Covered here are many skills that anyone can benefit from in a quest to polish their image. 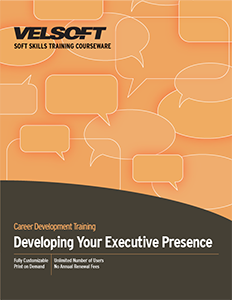 Covered in these sessions are vital skills for those with executive aspirations including: first impressions, interpersonal communication, speaking with impact, maintaining your impression, and leadership skills. Each Velsoft courseware training package comes complete with the material you need to deliver a high-quality session immediately. You will receive as part of the package an instructor guide, self-study guide, PowerPoint slides, assessments, and much more. Download a free sample today and see how it can work for you.